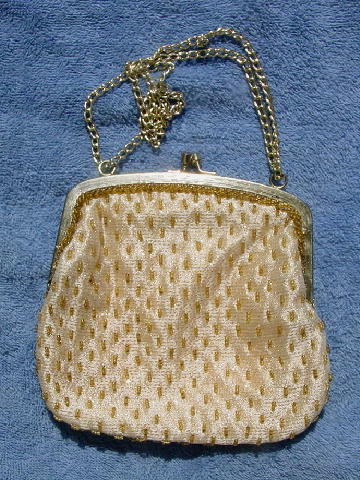 This vintage beaded purse is by Walborg and was handmade in Hong Kong. It has a very nice satin-acetate yellow lining with an open pocket. There is an etched line design gold-tone rim and bypass closure and a gold-tone double 15" long chain link handle. 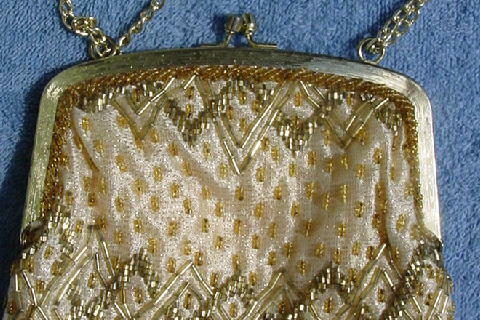 The antique cream fabric surface has a horizontal metallic thread running line design. It has tiny yellow-amber beads in sets of three in a staggered line design with the same color beads in a diagonal line design around both sides of the rim. 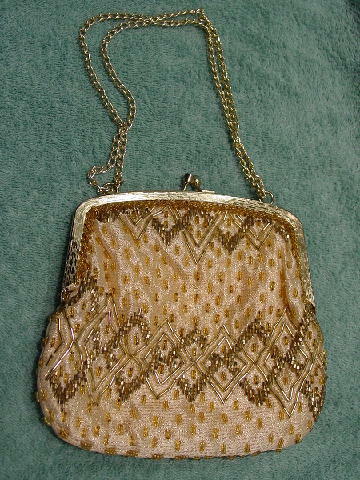 The front has a design pattern of gold-tone beads. It's from a former French model, who wore it once, to a movie premiere.